Since I’m a pastor, I’m deeply interested in being a part of and/or seeing God bring restoration and healing into people’s lives. It’s a joy to see God’s work in this area. 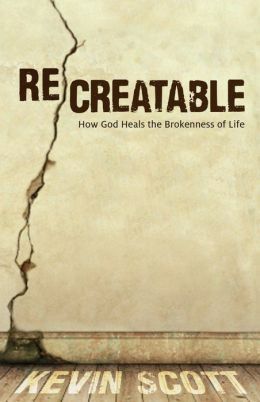 If you have an interest in that, I want to recommend that you pick up Kevin Scott’s new book, ReCreatable: How God Heals the Brokenness of Life. From this summary, Scott builds on each of the three lines and add his take on how God is at work in the lives of his people (as well as how we can be used to help in that process). As Scott notes, “God is in the business of putting broken lives and relationships back together again.” Amen. I totally agree. Stand out chapters, in my opinion, are on “Hope,” “Scripture,” “Community,” and “Mission.” Scott travels a well worn path with fresh observations and helpful challenges. The ecclesiological dimensions in regards to how the community of faith functions as a “family,” body,” and “pocket of the kingdom” are beautiful. I really appreciate how Scott sees the relationship between the church and the kingdom of God. If you are a follower of Jesus who is concerned with making other followers of Jesus, get this book. You won’t regret it!